March is here, and it’s time to hop to all those things that make your Easter a bright spot in your spring season! From finding the perfect outfit to hunting those brightly colored eggs, we know just how much fun this holiday is for you and your loved ones. We cannot wait to see just what you fancy for all your spring activities, so be sure to share a snap of your favorite looks on social media using #MatildaJane – our favorites just might be featured. For this month’s pretty printable, we’ve designed two sweet, simple projects to brighten this wonderful time of the year! Not only do they include the sweet MJ adorned egg below, but also the cutest bunny ears you ever did see. 😉 Add a little ribbon or elastic cording to the ears, and your darling daughters will have a little something that every bunny will love. 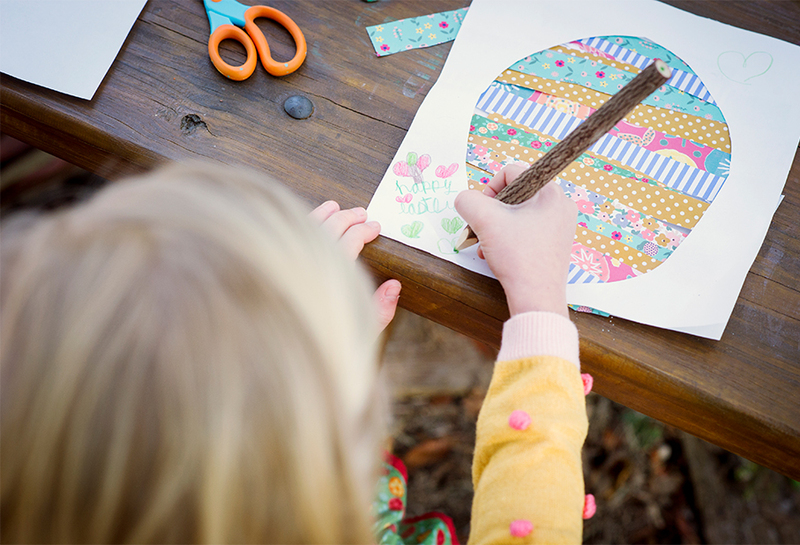 So, hop to it … and be sure to click the photo above to download these oh-so-sweet printables and get crafting today. I love all the crafts and DIY’s that can be done with little kids. It’s the thing that we enjoy to do the whole family. Hi everyone! I’m so excited to give you a first look at March. There is so much I can’t wait for you to see!! This time of year is one of my favorites. Cold days start to melt away – and you can finally start to think spring. It’s such a wonderfully busy time with Easter and Spring Break and those highly anticipated first sunny, warm days. Warmer weather on the horizon means we get to dive back into swim! This season we were all really inspired by summers at the lake, and you’ll see that in this beautiful sun-kissed palette and really pretty vintage silhouettes. We just had to design a few pieces for mom, too! These pieces – a classic one piece and a two-piece tankini – are super feminine and super flattering. We hope you love them as much as we do. Our goal with swim is always to make it feel as good as it looks – with thoughtful coverage and really good construction so you can really run and jump and play with no worries. This year for Easter, we wanted to give every girl an option she would love. While you’ll see lots of girly options (of course! ), you will also see some more casual options as well – in super soft knits and really easy silhouettes. No matter the fabrication, each new dress was made to make her feel extra special with favorite MJ touches, whether that’s fancy trims, one of a kind prints, or skirts made for twirling. And we are giving you lots of sister matches in baby and tween, and coordinating women’s looks, too – so everyone can coordinate for those spring events and pictures. Speaking of coordinating – there are so many really good mix and match prints in this release! From sweet snails to conversational chickens, to a really pretty peony Maggie created just for us, they are all just so super special and sweet for spring. What new arrival has caught your eye? I can’t wait for you to see it all on March 1! i would like to see the summer collection. I really like yo see your new collection. I love the colors of this release! Excited to see all the new pieces in the tween line. I absolutely love the peony print. They were my grandpa’s favorite flower. I always try to bring some to him when I visit his grave. I am so excited about the swim collection! And I love the the florals in the new dresses!!! I cannot wait to see the Tween & Women’s swimsuits, & of course more of the Tween & Women’s clothing line. From what I can tell it look fabulous!!! All the yellow!!! Loving it all!! Love the sleeve on the moms dress!!!! I love the Mama swim coverup from last year. Looking forward to the Blue Sneaked above in the blog. I love the blue one piece swim suit for girls and the cover up!! I think the peonies are truly incredible. I have to be honest though, I think you have truly hit it out of the park with this collection! I cannot to have a trunk show this season. I think I’m in l❤ve with it ALL!! Everything has caught my eye! But what I love the most so far is the mustard floral fabric! I’m IN LOVE with those dresses! They are gorgeous with that blue! Love the yellows and blues…can’t wait to see it all in person! The matching blue floral dresses for mother and child look beautiful! Love the ear rings on the mama. Loving the sweater. Would like too see more of your adult swimming wear that is available.